The Brvtalist Premieres: Stave + Grebenstein - "Alfa"
The Brvtalist is pleased to premiere a new track from Stave + Grebenstein. 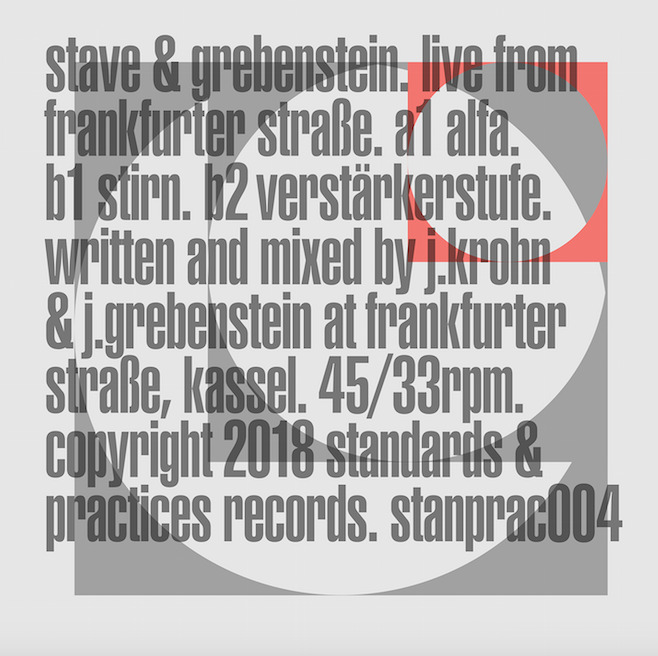 The first collaboration between Jonathan Krohn (Stave, 1/2 of Talker) and Jan Grebenstein, the new EP, Live from Frankfurter Strasse, consists of recordings which followed improvised live performances in San Francisco, Los Angeles and Berlin. The fourth release on Standards & Practices, this is a seismic offering which sees two of the heaviest producers today in top form. "Alfa" is the A side of the record and an immense and brutal excursion through the vast unknown. At times disorienting but precisely calculated, it exemplifies the duo's sheer force and sets the tone for a powerful release. Out September 14th on 12" and digital. Visit Standards and Practices for more.